The long-awaited and much-delayed GDrive is likely to be released in the near future as more pieces of its integration are revealed. 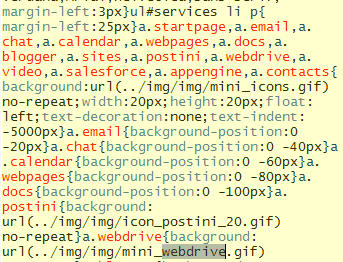 Cédric Vergé noticed a change in one of the CSS files for Google Apps: there's a class named "webdrive" and an icon for the new service. Last week, Tony Ruscoe found some traces of an internal Google document which mentioned an update for Google Docs, which will slowly morph into GDrive. Apparently, Google Docs will be the web interface for GDrive, while a Windows/Mac client will integrate the service with the operating system and make it easy to synchronize files. Wasn't the Google Webdrive for Google Only Internal use? It'll be interesting if Google releases it like Gmail, on April Fool's Day. I'm hearing March 15th. My sources say that they will offer 10 gig free, with pricing plans beyond that. Would love to have it soon! Go Googlers! Stop teasing and bring it out! I've written tons of code where I named classes, methods, and assets to something that's planned only to have it never come to fruition. I would definitely not assume these artifacts prove anything. Even my blog has scripting objects named things I planned on, but never got to. That being said, at the rate Google and Microsoft are adding cloud servers... I fully expect web based drives to be very popular soon. The OS is the biggest hurdle, not the web anyway. Well, that's not only trouble for MS but also very much for Mac. If it is encrypted, that would put paid to the critics who are worried about "Big Brother Google"
Did you guys hear about a service that was called Streamload and late MediaMax. It allowed users to have tons and tons of storage, I had hundreds of terrabytes in my account. You would mostly only pay for download traffic. The thing being the Streamload client software would scan your file, and if it was popular, thus already uploaded once by another Streamload user, then it would magically beam instantly into your account. This way, basically all DivX, Mp3 all that stuff was already there on their servers, so no need to upload them again, and no need to duplicate the cost of storage, Streamload would just store one copy of each file even if many users would have and use the same files. Then Streamload had this feature of allowing users to send files to other users. Basically like Google Docs file collaboration feature, you type in the email or username of the users to give access to your files. Streamload also allowed you to host your files on open URLs, also host whole folders full of files. Again you would have to cover the cost of hosting. Google should do it like this, if you share some files ou should not pay yourself for all the bandwidth used, you would let each of the invited users to pay each themselves for their used download bandwith. I can't wait for the Google $00 Android laptop with full cloud computing access to this service. Not only for seamless and cheap terabytes of online storage, but also for full grid computing such as using Google's grid to quickly encode HD videos, to render animations, pictures and effects. Nobody is forced to use Google, much less GDrive. I store lots of photos on various sites, including Picasaweb and am looking into similar repositories. Store some files in DropBox. I use and will continue to use online storage primarily as a backup. If the OS and/or browsers started forcing it, I expect OpenSource movement would provide a way around it. If not, i would code my on OS - it's really not all that hard. That's a really interesting catch! Never knew people monitor CSS changes to such details! Wow, What a news!!!. Cannot wait to see this go live. Dreaming for months!! of web based access and get rid of Desktop. Hi all. Full disclosure here: I work for www.nomadesk.com, which offers easy and secure file sharing, wherever you are. I read your post on Google's GDrive with great interest and just wanted to add NomaDesk to the mix. In fact, NomaDesk has similar features and is geared towards the need of the "digital nomad". We are convinced that the more data gets synchronized, the more likely it gets compromised. Therefore, NomaDesk includes an encrypted virtual drive that keeps your files securely available off-line and remote file shredding and IP-tracking with TheftGuard. Of course, we impose no limits on storage and bandwidth. The current NomaDesk release 2.6 displays file states and indicate whether files are already in use by someone else. You are also able to add and review notes (i.e. meta-data). The Mac version is on its way. They should have launched this years ago. I've been using dropbox for a very long time and it really is the kind of stuff Google should have done back then. That's great news for GDrive .. I keep googling this and it seems that are no new sightings of The Drive in the wild. Can't wait to get this service GDrive thanks for sharing. come on google, we will be forced to move to alternatives if you don't hurry up with this web drve of yours!! 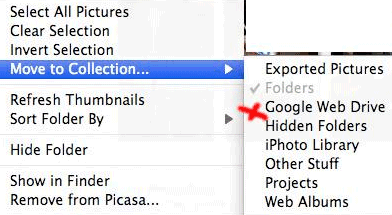 and btw, please rename google docs to google files!! Wow, congratulations on being yet another blog to use the phrases, "looks like", "GDrive" and "released in the near future" far far far too closely together. Surely you've seen every single other tech blog out there doing the same thing...? No? Oh.